The old medieval town of Northampton was destroyed by fire in September 1675, entailing its almost complete reconstruction. 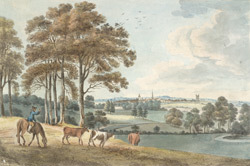 Travelogue author Celia Fiennes visited in the 1690s, noting that about a mile from the town there opened up a "noble prospect to your sight, a large town well built, the streets as large as most in London ... the houses well built of brick and stone". Daniel Defoe thought Northampton "the handsomest and best built town in all this part of England".